I'm sure that you are busy getting ready for the ultimate eating day of the year - Thanksgiving! For me, the best way to control my eating during the holidays is to make healthier alternatives of my favorite foods. That way I don’t feel a bit of deprivation. This post contains the best of my favorite tried and true Thanksgiving side dishes! Now on to the recipes…ENJOY! Makes approximately 4 cups of sauce. In a medium saucepan over low heat, combine the honey, stevia and orange juice. Simmer until everything is completely dissolved. Add the ginger, orange zest and cinnamon stick. Stir. 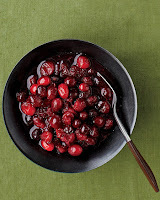 Next, add the cranberries and simmer stirring occasionally for 45-60 minutes. The mixture should become thick. Remove from heat and stir in the salt. This can be made several days in advance and kept in the refrigerator. There is nothing I love more than a tasty cranberry sauce. It is SO easy to make… and tastes 1000 times better than the canned stuff. This is awesome as a condiment for sandwiches, and even a dessert topping! This is an adaptation of a recipe I found about 5 years ago on www.allrecipes.com. I’ve changed some of the ingredients to my tastes, and lightened it a bit, eliminating unneeded butter, and using reduced-fat sausage. In a large skillet over medium heat cook the sausage until brown. Transfer the sausage to a large bowl. Now, use the same skillet over medium heat and add the onions, apples, celery, and poultry seasoning. Cook, stirring frequently for about 10 minutes. Stir in rosemary, cranberries, and sage. Mix the onion mixture with the sausage mixture and Stuffing Mix in the large bowl. Add the chicken broth and salt and pepper to taste. I’ll be honest; I usually don’t stuff the turkey… I actually make this the day before, and then put it in my crock pot on low to reheat on Thanksgiving Day. Easy Peasy… and delicious! This is a classic recipe that makes an excellent substitution to the traditional Green Bean Casserole that is found on many Thanksgiving dinner tables. This recipe was taken from the Better Homes and Gardens Cookbook, and adapted by me to lighten it up. I think it tastes just as great as the original. In a small saucepan melt the 1 tablespoon butter. Add the shredded sweet pepper. Cook over medium-high heat for 5 minutes or until crisp-tender. Set aside. In a blender or food processor bowl combine the 4 Tablespoons softened butter and the pine nuts. Cover; blend or process until almost smooth. Add cooked sweet pepper, lemon juice, salt, and black pepper. Cover; blend or process until almost smooth. Set aside. In a covered saucepan cook beans in a small amount of boiling water for 12 minutes. Add the sweet pepper strips the last 3 minutes of cooking. Drain the beans and sweet pepper strips. 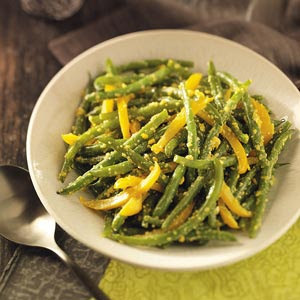 To serve, transfer beans and sweet pepper strips to a serving bowl. Add the blended margarine mixture; toss to coat.